ELYRIA, OH (WOIO) - Elyria's Mini Pioneers are a pee wee team made up of 10- and 11-year-olds. They went 8-0 this year, and their perfect record earned them a spot in a championship game. They were supposed to be there, that is, but instead of playing and picking up their awards in person, the team is back on the practice field. 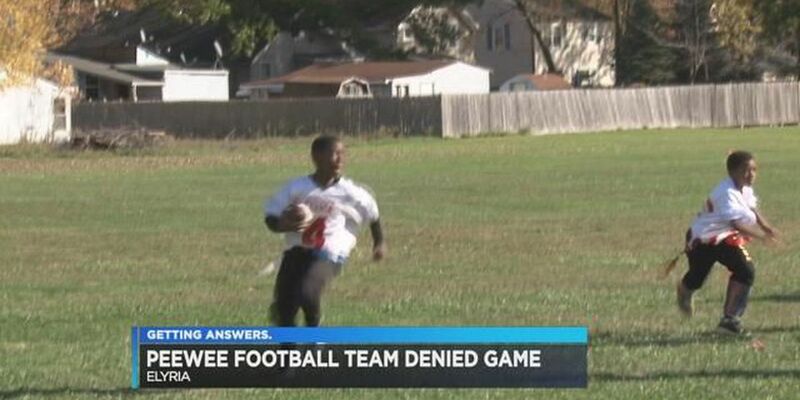 Their parents say it's because one of the coaches on the team they were beating last week ran onto the field and punched an 11-year-old in the gut, sending him to the hospital. The child's mother, Erica Kara, saw it all from the sideline. Both of her twins are on the team, and were in the game playing a North Ridgeville pee wee team. That's when her son was sent to the hospital in an ambulance, spitting up blood. Kara took pictures of the bruises, and says her boy is recovering from a broken rib. Police were called, but are still investigating. Coach Joe Stevenson was on the field and also saw what happened -- he says that adult was way out of line. Pioneer coaches say their kids earned the top spot, but the other coaches told them they couldn't play North Ridgeville kids anymore and that they couldn't come back for the big game. So instead, Elyria's league and parents threw together a celebration. A Pioneer coach says North Ridgeville league organizers ended up calling and inviting the boys to pick up their award. After what happened, most parents declined the offer.